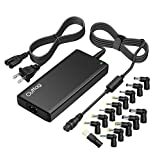 This universal laptop charger can replace many 65W 45W laptop AC adapters, perfectly works with many brand notebooks, ultrabooks, chromebooks. Input: 100V-240V 50-60Hz. Output: DC 18.5v 19v 19.5v 20v Max. 70 Watt. 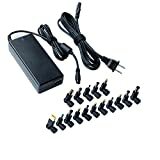 This laptop charger is with advanced security technology, premium mateiral and strict aging test. 12 months global warranty, any quality problem, free for new! 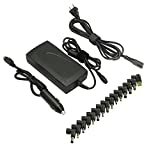 Package Content - 1 x Universal laptop charger 70w, 1 x 6 feet power cord, 1 x Connectors set. Worldwide AC Input Voltage: 110-240V 50-60Hz; Output: 18.5V 19V 19.5V 20V. Power:30W/33W/40W/45W/65W max(Power=Voltage x Amps). 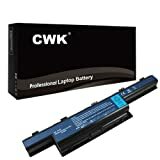 NOT SUPPORT LAPTOPS BELOW 18V OR HIGHER THAN 65W. 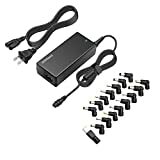 With these tips,we could use it for many 18-20V HP/Compaq Dell LENOVO/IBM Toshiba/Asus/Acer Gateway Samsung Sony compatible laptop models charging. 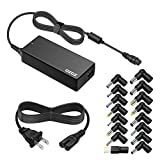 1,This adpter cannot work with 45W dell laptops! 2,Its output voltage varies from 18.5V-20V due to different connector. 3,We marked connector with voltage and NO and its dimension is O.D. x I.D. 5,If your laptop model not listed,if not sure about your need,if any problem with our product,please email support@outtag.net.Wish you excellent user experience! 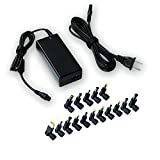 This 65W laptop charger is compatible with 45W laptop AC adapter. Input: 100V-240V 50-60Hz, Output: DC 18.5V 19V 19.5V 20V Max 65W. 90 Day Money Back. Buy with confidence! Nearly all our products have UL, CE and RoHS certificates. Products trademarked CWK are marketed and sold exclusively by CWK TECHNOLOGY. Copyright CWK © 2015 All Rights Reserved.